For the first time on record, more non-Mexicans than Mexicans were apprehended at U.S. borders in 2014 by the Border Patrol, according to a Pew Research Center analysis of more than 60 years of Border Patrol data. This shift is another sign that unauthorized immigrants from Mexico are crossing the U.S.-Mexico border significantly less often than they did before the Great Recession. About 229,000 Mexicans were apprehended by the Border Patrol in fiscal year 2014 compared with 257,000 non-Mexicans during the previous year, according to recently published Border Patrol data. Taken together, total apprehensions of Mexican and non-Mexican unauthorized immigrants (more than 486,000) were up 16% over the previous year. These numbers are dramatically different than in 2007 when Mexican apprehensions totaled 809,000, compared with just 68,000 non-Mexicans. The number of Mexican immigrants apprehended at the border peaked at 1.6 million in 2000, the Pew Research analysis showed. The last time Mexican apprehensions were as low as they are now was in 1970 when 219,000 Mexicans were apprehended. 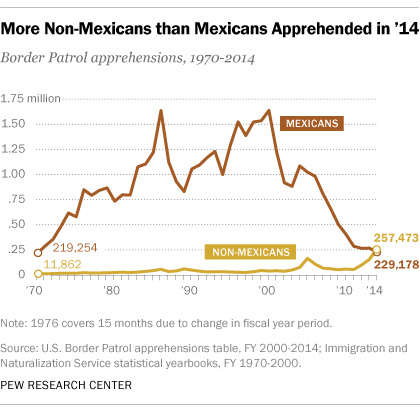 In 1970, non-Mexican apprehensions totaled just 12,000. The recent increase in non-Mexican apprehensions is due in part to a surge in unaccompanied Central American child migrants crossing the border without their parents. In fiscal year 2014, nearly 52,000 unaccompanied children from El Salvador, Guatemala and Honduras were apprehended at the U.S.-Mexico border, more than double the total from the previous year, according to U.S. Customs and Border Protection data. By contrast, the number of unaccompanied Mexican children apprehended slightly declined over the same time period, from 17,000 to 16,000. The new Border Patrol apprehensions data reflect a broader ongoing shift in the U.S. unauthorized immigrant population that was shaped by a migration wave from Mexico that lasted from the 1980s until the Great Recession. Mexico remains the top country of origin for the nation’s unauthorized immigrants, but their numbers have declined since 2007, according to a Pew Research Center analysis. Despite the decline, the estimated 5.9 million unauthorized immigrants from Mexico still account for a majority (52%) of the nation’s unauthorized immigrant population. As numbers have fallen, unauthorized immigrants from other parts of the world are steady or on the rise. The unauthorized immigrant population from Central America, Asia, the Caribbean and the rest of the world grew slightly from 2009 to 2012. Over this time period, the number of unauthorized immigrants from Central America grew by 100,000. There was a similar increase in unauthorized immigrants from Asia. Although investments by the U.S. federal government on border security have increased and migration has slowed, the U.S. public has put a greater emphasis on border security. From February 2013 to August 2014, the share of Americans who said the priority should be on better border security when dealing with illegal immigration rose from 25% to 33%. Meanwhile, as fewer unauthorized immigrants from Mexico try to enter the U.S., those already in the U.S. are staying put. In 2013, unauthorized immigrant adults had been in the U.S. for a median of 13 years, up from eight years a decade earlier, a trend driven in part by Mexican migration patterns.